This paper introduces the path forward for the integration of freeform optical surfaces, particularly those related to φ-polynomial surfaces, including Zernike polynomial surfaces, with nodal aberration theory. 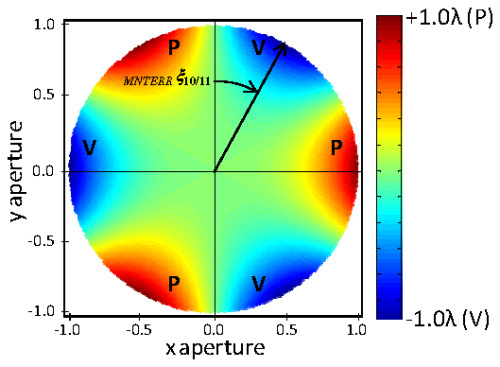 With this formalism, the performance of an optical system throughout the field of view can be anticipated analytically accounting for figure error, mount-induced errors, and misalignment. Previously, only misalignments had been described by nodal aberration theory, with the exception of one special case for figure error. 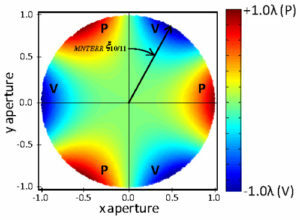 As an example of these new results, three point mounting error that results in a Zernike trefoil deformation is studied for the secondary mirror of a two mirror and three mirror telescope. It is demonstrated that for the case of trefoil deformation applied to a surface not at the stop, there is the anticipated field constant contribution to elliptical coma (also called trefoil) as well as a newly identified field dependent contribution to astigmatism: field linear, field conjugate astigmatism. The magnitude of this astigmatic contribution varies linearly with the field of view; however, it has a unique variation in orientation with field that is described mathematically by a concept that is unique to nodal aberration theory known as the field conjugate vector.